Perennials have long been used in carefully thought-out flower gardens that provide beauty, fragrance, and flowers for cutting from Spring until late Fall. To get started you must first decide what type of perennial garden you would like to plant. There are gardens for attracting butterflies and hummingbirds, gardens for shady situations, for cut flowers, and for dry or wet sites. In addition to grouping perennials together in various types of theme gardens, many are equally as useful planted as focal points, accents, in masses or small groups, or as a border in landscape beds and islands. Too, many perennials are great performers in container gardens that can be placed on porches, patios, near the swiiming pool and other outdoor living areas. Keep in mind that it's important to know the cultural needs (soil, sun, nitritional) needs of each specific variety of plant in your garden. Before doing anything else, make a list of the perennials that you'd like to plant and record basic information as to size, light requirements, soil preference, and hardiness in your zone. Then draw out at least a simple sketch of the garden; its shape and indicating where certain types of plants will be located in the garden. If you can draw it to scale that's even better. Before you can begin soil preparation and planting you must have plants! Visit your local nursery and garden center or online nursery to purchase plants that you have selected for your garden. If you will grouping various perennial plants together in a garden, use marker spray paint, flour, or a garden hose to outline the shape of your perennial garden on the ground. Remove any weeds inside the outlined area by digging or spraying with an herbicide listed for use in garden beds. Make sure to follow instructions on label for mixing weed killers, such as a glyphosate-based product. Wait at least two hours or until weed killer is completely dry before planting. (Optional) - Disperse a 1 to 2 inch layer of compost, such as mushroom compost, composted manures, or your own home made compost, over the garden area. Till or turn amendments in to a depth of 6 inches or so. No need to add fertilizer. After tilling rake smooth. You are almost ready to begin planting. Note: It's okay not to till or turn the soil in your perennial garden. You can add ammendments later when planting plants individually in undisturbed soil. Set all of the perennial plants out in your garden, making sure to space properly to allow for future growth, and allowing space for perennials you couldn't find right away but intend to plant later. Use marker paint to draw circles in the garden that indicate the width of missing perennials that will be planted later. Now you can begin planting. If you tilled the garden bed and added compost dig the planting hole the same size as the root ball of the plant. If you did not till the soil, dig the planting hole 2 to 3 times the width and a few inches deeper than the root ball or at least 12 inches wide. The wider the planting hole the better. If your soil is of poor quality, and specific perennials plants you are planting will require a fertile soil, mix enough compost with the native soil removed from the planting hole to condition it. Now you are ready to plant. 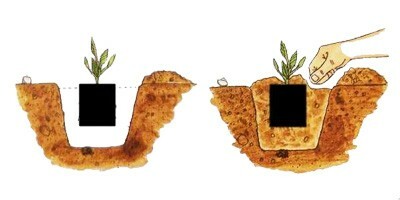 Set plant in hole and backfill around root ball, making sure that the top edge of the rootball is at ground level or slightly above to allow for settling. Make sure to tamp soil mixture lightly as you back fill to remove any air pockets. Water each plant thorougly after planting, and on an as-needed basis until established. It's important to know the water needs of each specific variety of plant in your garden. Some perennials, such as sedums and lantana, like life on the dry side, while others such as canna lilies and bee balms like more moisture. Mulch garden with a 1 to 2 inch layer of aged wood mulch, pine straw, or compost.